TSSAA only recognized Litkenhous football ratings which were mathematically computed on score by difference only and was fuzzy on games out of state. E B always played reserves after a 14 point lead and played several games out of state, so Litkenhous penalized teams that yanked their starters and played better teams from other states. In 1952 and 1962 Central clearly had the best team in Tennessee (#1 in most other polls), but Litkenhous gave the edge to Columbia in 1952 (who beat all the teams in Nashville so they had to be good) and in 1962 to Oak Ridge (who scored on the last play of the game at home to beat Johnson City 19-14, a team we shut out 14-0 at Johnson City and reserves played the last quarter. Our 1962 team was rated #5 in the US and Oak Ridge didn’t crack the top 30. Our away wins over the #2 team in Alabama and #4 team in Florida didn’t count; Oak Ridge played all in-state teams. “Nuff said. And I would be remiss in not mentioning Central’s undefeated 1929 basketball team who wasn’t invited to the official state tournament because they had played too many games. That team instead went to an invitational tournament in Nashville for other unfortunate teams that were also ineligible and destroyed the competition, including a 33-0 (yes, a shutout) win over MBA in the semifinals. Many earlier teams including baseball in 1913, football and basketball in 1914, and basketball in 1920 were undefeated before “official” state champions were recognized. 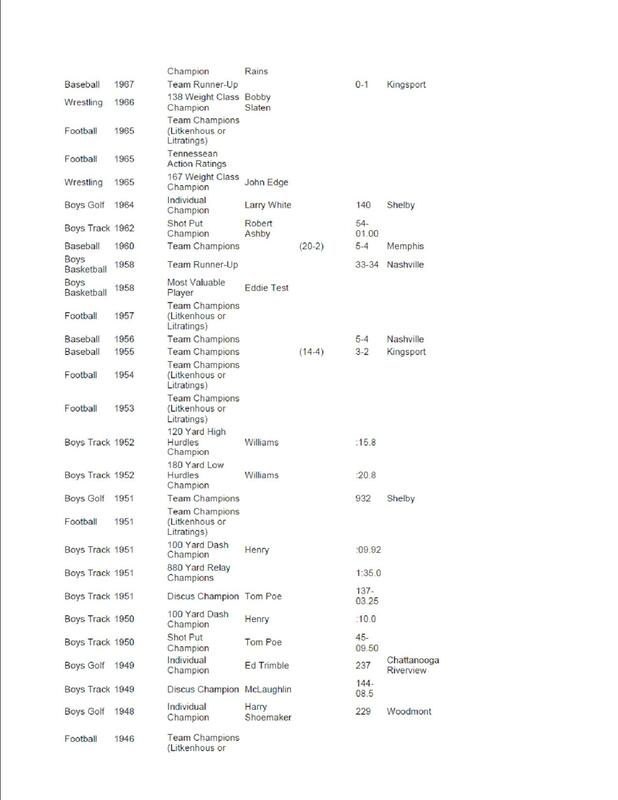 Finally TSSAA refused to hold any championships in boxing (one of the reasons was a terrible beating Central’s team gave to a Nashville team with TSSAA officials observing), so no champions are shown even though Central was the team national champions in 1947. 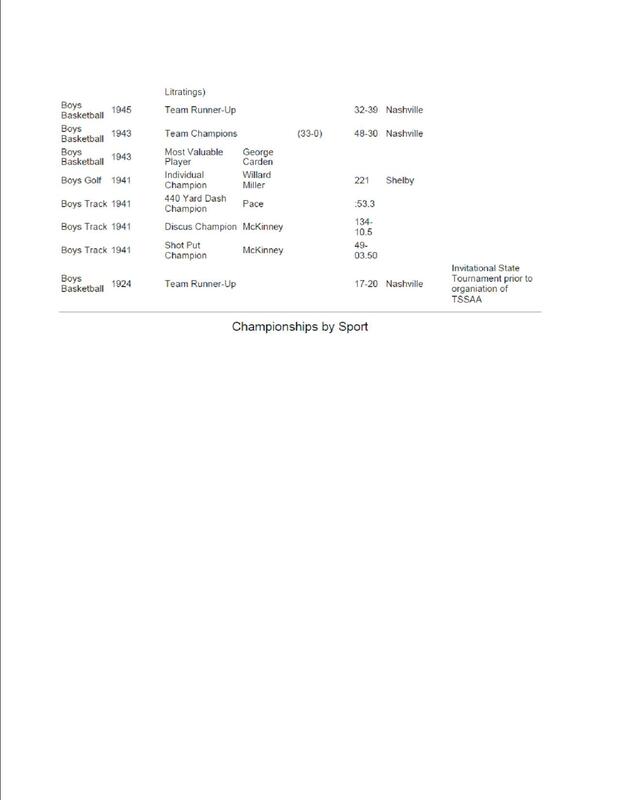 Moreover after Central’s win, the TSSAA then forbade any team to go to the national championships. 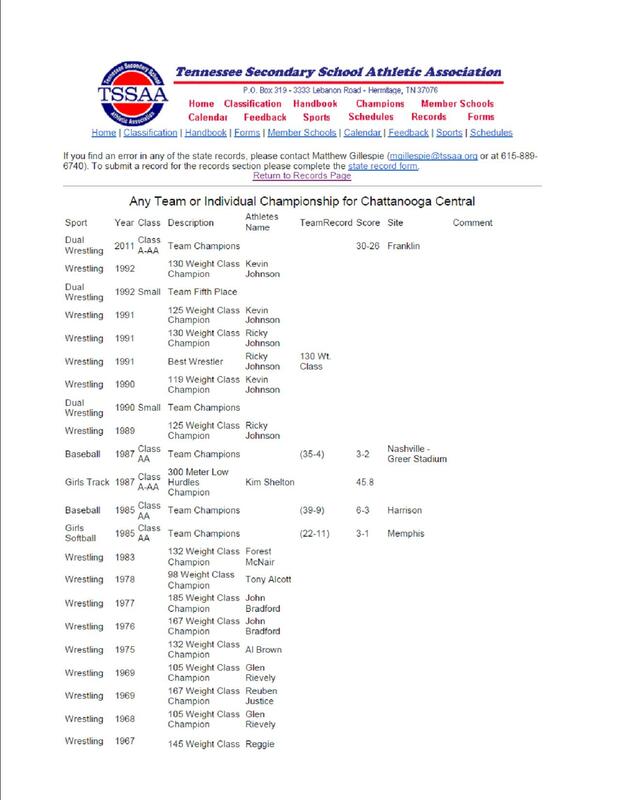 So in 1948 Central sent a few individuals, most of whom won their divisions (Prince Kendall was voted the tournament’s outstanding boxer), but did not send a “team” that would antagonize TSSAA. Archie Slaten of those teams was an NCAA champion at Miami in 1951-2. Memory lapse: In 1962 Oak Ridge trailed 19-14 at home to Spurrier and Science Hill High, scoring on the last play of the game to win 20-19. We had earlier beaten Science Hill 14-0 at Johnson City, and Coach Etter played reserves the last quarter. Johnson City got most of their offensive yards on one play against the reserves, who had only 10 men on the field for that play. Mr Spurrier threw 15 passes that game, none were cauught by his receivers, but two were caught by Central. Fortunately for Spurrier, the Heisman voters four years later never saw that game film. Left out the 1909 baseball team, also undefeated. Their story has already been posted on the connection site; I’ll upload the Times article of 5/26/1909 shortly. Information errors in everything I’ve been looking at recently. US Census records are the worst so far. Names are frequently wrong or incomplete. They are useful, I guess, in determining where someone lived at the time if you can figure out who they are. Have you told TSSAA of the outright errors in their records?